BaseSpace Correlation Engine (formerly NextBio Research) applications support early-stage research to identify mechanisms of disease, drug targets, and prognostic or predictive biomarkers. Explore the continually growing library of curated genomic data. The easy-to-use, web-based tools mine this data and create billions of novel correlations. The full Professional version of BaseSpace Correlation Engine offers a complete solution for data storage, analysis, and integration. 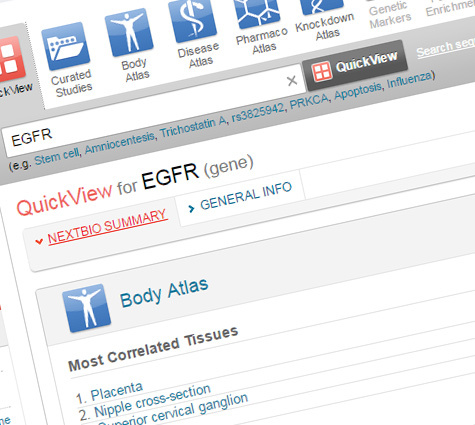 Analyze gene function across more than 20,000 genomic studies in major disease areas. Assess gene roles across different types of molecular data. Understand gene activity across studies in human, model organisms and cell line models. Analyze candidate molecules for pharmacokinetic profiles or toxicity indications. Compare disease profiles across cohorts and different stages of disease. Assess pathways playing significant roles in disease development across multiple studies and data types. Use the cross-species analysis framework to optimize experimental systems to test mechanisms of disease progression or drug response. Compare human data to experimental results from model organisms to understand biological context.